Tulsa high school history teacher Vince Facione expected to spend at least $300 before the first day of school. He gives each of his 190 students a three-ring binder. Elementary music teacher Tony Flores’ entire classroom budget for the year will be expended on music for three performances. Last year, he bought new instruments, to the tune of $1,000 out of his own bank account. In Danielle Childers’ pre-kindergarten classroom, students will have snacks for snack time, mats for naptime and stickers for a job well done, but the cost of those items falls on her. 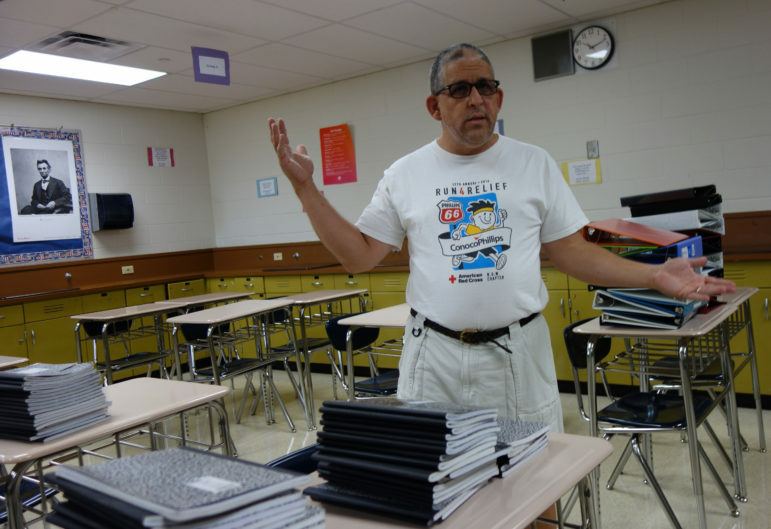 Tulsa high school history teacher Vince Facione starts the year by giving each of his 190 students a three-ring binder. He also stocks his classroom at Will Rogers High School with highlighters and paper and expects to spend at least $300 before the first day of school. “I enjoy what I do, so I see it as an investment,” Facione said. According to a national 2015 survey of more than 500 teachers by Agile Education Marketing, each spent an average of $490 of their own money on their classrooms. Each received an average $300 from their school. At many private companies and state agencies, supplies like paper, pens, scissors, and notepads are purchased for staff members by the employer. State agencies like the Department of Education and the Legislature, for example, have supply closets stocked with the basics. Of course, not all items that teachers purchase are technically indispensable. They could, perhaps, live without things like maps and posters strung along the walls, beanbag chairs for a reading corner and pool noodles for rhythm games. But teachers say the obvious essentials are not enough to foster learning – they must go above and beyond to creatively engage students, using extras such as iPad apps, art materials and wall decorations. The deficit begins at the source. When state and local education spending is relatively low, or overhead or salary costs increase, the amount left for supplies — a lower priority — shrinks. The state doesn’t earmark funds for supplies. Districts get funding based mainly on enrollment and then allocate the money, allowing schools some flexibility. Superintendents and principals weigh the priorities. Teachers often get other help — from PTAs, donors, friends and relatives. Parents also are asked to provide many supplies. But teachers still shell out hundreds of dollars each year for the classroom. Districts can’t or won’t pick up the tab. Recent budget cuts are making the situation worse. In Oklahoma City Public Schools, elementary teachers’ discretionary funding was reduced from $25 to $15 per student for the current school year. The reduction is expected to save the district $260,000. Some districts have eliminated these stipends all together. Flores’ school gave him a budget of $300, and he knows he’s one of the lucky ones. For the set of musical instruments he bought last year, he spent $950 out of pocket plus $3,000 raised online through Donorschoose.org and all of his classroom allotment. Flores’ students perform three musicals each year. Cost of the CDs and rights to perform: $300, his entire classroom budget. Oklahoma ranks 49th in average teacher salaries among states and the District of Columbia. Educators here haven’t had an across-the-board pay raise in eight years. Danielle Childers shops at a teacher supply store in Norman for her Tecumseh pre-kindergarten class. She expects to pay $300-$400 out of pocket for supplies early in the school year. A federal income tax deduction allows educators to deduct unreimbursed classroom expenses up to $250 without having to itemize. But depending on a household’s tax bracket, the amount saved can be relatively small. Many teachers say it’s of little help to their pocketbooks. That’s also true for the annual sales-tax holiday weekend, when clothing and shoes, but not school supplies, are exempt from state and local sales tax. 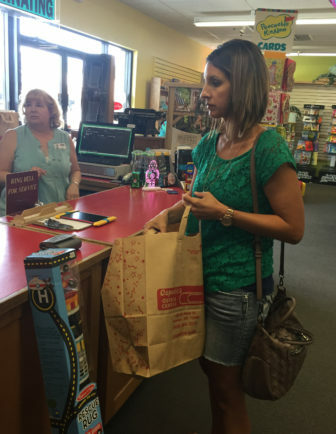 Childers shopped for her Tecumseh prekindergarten classroom in late July at Copelin’s teacher supply store in Norman. She earned a $100 gift card by collecting grocery receipts from her students’ parents. Her total rang in at $99.68, and she said she will probably spend $200-$300 more out of pocket as the new school year gets underway. She usually buys snacks, rest mats, and extra markers and glue for the students who can’t afford to bring their own. Childers said when she started teaching 11 years ago, she received a classroom budget but hasn’t in several years due to funding cuts to education. School administrators could fund every teacher’s classroom need or want, but many say it’s a matter of prioritizing supplies over other needs. Public schools absorbed $74.4 million in funding cuts last fiscal year as the state worked to fill a $1.8 billion budget hole. It left administrators like Jarod Mendenhall, superintendent of Broken Arrow Public Schools, with some hard choices. “We try to do everything we can at our level to offset costs that might occur in the classroom. We make sure we have plenty of copy paper. But this last go-round of cuts has been really difficult,” Mendenhall said. To reduce expenses, the district eliminated a unique teachers’ benefit: a stipend of 3 to 4 percent of their salary as a back-to-school bonus for returning teachers. Many teachers counted on that to purchase supplies, he said. Laura Childress, a kindergarten teacher at Oakridge Elementary in Oklahoma City, spends about $500 a year on her classroom. Her mother helps her out by buying supplies and decorations. Teachers’ unmet classroom needs go beyond pricier items like whiteboards and iPads. Many are basic items like paper, markers, pencils, folders, books, pencil sharpeners, tape and chairs. Many teachers utilize Donorschoose.org for funding. The website is how Laura Childress, a kindergarten teacher at Oakridge Elementary in Oklahoma City, has received supplies like play dough for her classroom. 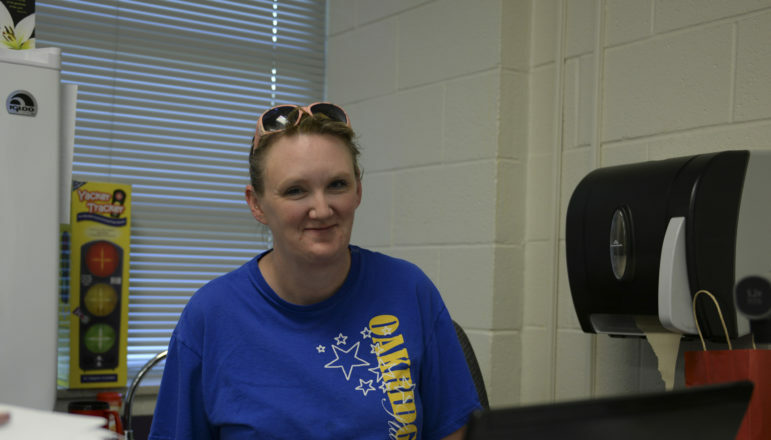 Childress spends about $500 per year on her classroom. She has paid to laminate papers, at 50 cents a foot, because the laminator at the school is often broken or out of paper. Her mom buys a lot of classroom supplies and decorations for her. “I buy my own dry erase markers. I tell my parents what I need instead of relying on the school- or district-provided list of supplies,” Childress said. Last fall, Oklahoma City first-grade teacher Chantel Jones had spent $400 on supplies by November, including on notebooks, pencils, crayons and construction paper. She also buys apps for students to use on her iPad. Last fall, Oklahoma City first-grade teacher Chantel Jones had already shelled out $400 on supplies by November. She bought spiral notebooks, pencils, crayons and construction paper. She buys apps for students to use on her iPad, the most expensive one ringing in at $9. And she bought colored ink, so the decorations she creates on the computer can be in color instead of black and white. 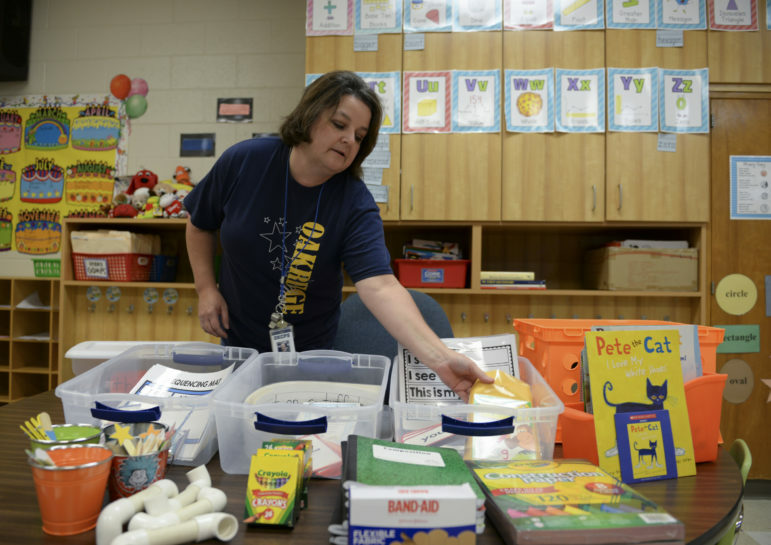 In order for teachers to do their jobs, they need basic supplies and the schools just don’t have the money, said Nancy Bolzle, executive director of The Pencil Box in Tulsa, a nonprofit that operates a free store of donated school supplies for teachers in high-poverty schools. Bolzle recalled a teacher who came into the store looking for dry-erase boards. The teacher said her school mandated a new curriculum that requires each student to have their own dry-erase board, but there was no funding for them. She also remembered a geography teacher who came in and discovered that The Pencil Box carried air-dry clay, which students can use to create relief maps. The items most in demand, though, are pencils, paper and notebooks. Cox, who is also superintendent of Peggs Public School in eastern Oklahoma, said the district has always bought school supplies for each student out of the school’s general fund. It’s a service to parents, he said, as well as a way to minimize needs that teachers may try to fulfill on their own. “Why should they sacrifice like that, when they’re providing the foundation for everything a child needs for adult life?” Cox said.